This image is the companion image to that in the previous post. 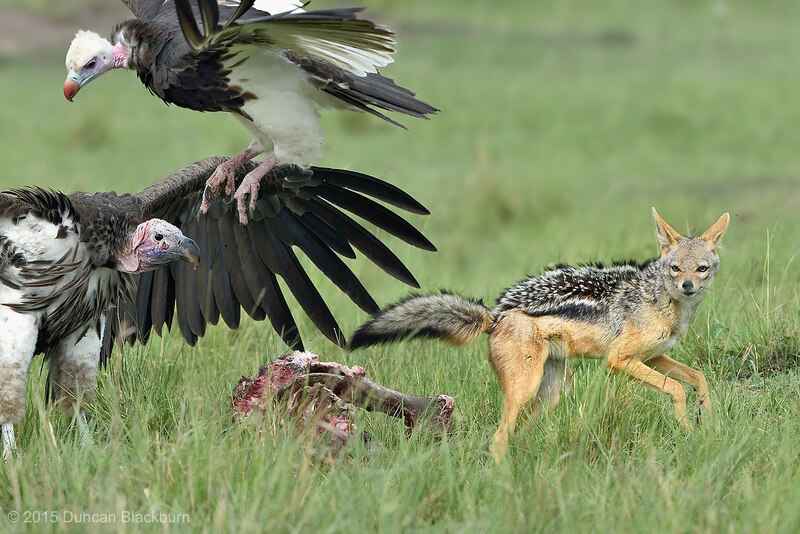 No sooner had the Lappet-faced Vulture and Black-backed Jackal begun to size each other up, when out of the sky came a White-headed Vulture! The competition for the remains of the hippo calf just became more intense! The white-headed vulture (Trigonoceps occipitalis) is an Old World vulture endemic to Africa. It has a pink beak and a white crest, and the featherless areas on its head are pale. Its has dark brown upper parts and black tail feathers. The feathers on its lower parts and legs are white. It has a wing span of 2 m and spends a lot of time soaring looking for food. It roosts in tall trees near to water at night.